Finally, like any other marketing discipline, Influencer Marketing can’t do everything at once. For some reason, Influencer Marketing has been expected to achieve low CPM [Cost Per Thousand], high CTR [Click-Through Rate], increased sentiment, etc etc. But all of those targets are completely different! To achieve each, you would use a completely different type of Influencer and a completely different type of campaign. Maybe a Power for a low CPM, Local Heroes for increased sentiment and Niche for CTR. So set yourself up for success by knowing what you want to achieve from day one. The key is to carefully identify the metrics that matter most for your brand. Whether it’s likes and views, positive sentiment, conversion to purchase or heightened awareness, your Influencer activity needs to be highly focused and accurately measured. There’s a lot more to say about Influencer marketing, but hopefully these 5 parts to our report focuses things a little and removes some of the misunderstandings surrounding this magnificent marketing channel. One that we should approach with the same clarity and professionalism as we would any other — recognising that “one suit”, does not, and never did, fit all. Under the Influence is written by Dudley Nevill-Spencer, Head of Strategy and Innovation at Live & Breathe. Naming Influencer just by scale – Mega , Micro, Nano etc, isn’t smart. Nomenclature that describes Influencers by their size asserts that size is the most distinctive factor. Its not. It ignores the important factor, the “effect” different types of Influencers have on your brand. These are the terms I prefer to use. Because of the above, they are especially suited to working with any brand looking to establish itself in a new category. Most savvy followers know that the majority of the social content and lifestyles on show are fake. Highly desirable, but still inauthentic. Presenting a glimpse of an ideal life. For these Influencers, followers might not trust you, but they might idolise you. This makes power Influencers best placed to drive brand awareness and aspiration. Stay tuned for part 4/5, or get in touch for the full report. Mark Ritson, in his column for Marketing Week, described Influencer Marketing as untrustworthy. And he made his point in an amusing way. Photocopying his bum, opening an Instagram account, buying followers and using an Influencer market platform to get brands to pay for his endorsement. It was funny - but irrelevant. He’s right that there are ill-informed brands spending money in stupid ways, but that’s no different to brands falling for fake circulation numbers of some dodgy title. And there are loads of those. Anyway, I digress. The power of Influencer Marketing is in generating multiple advocates over time who effectively market your brand for you. Some free, some gifted, some paid. The scale comes in the focus and concentration of Influencer engagement over time, and building a network that - unlike Ritson’s beloved TV ads – doesn’t disappear once the TV spot has gone. (Of course, sometimes TV ads are the right thing to do – it simply depends what you are trying to achieve). But back to scale being inverse to response. Below is a chart I created 4 years ago – “The Influencer trust continuum”. Along the bottom axis you can see the Scale (Reach) of Influencers, and on the horizontal axis the rate of response and level of Trust. 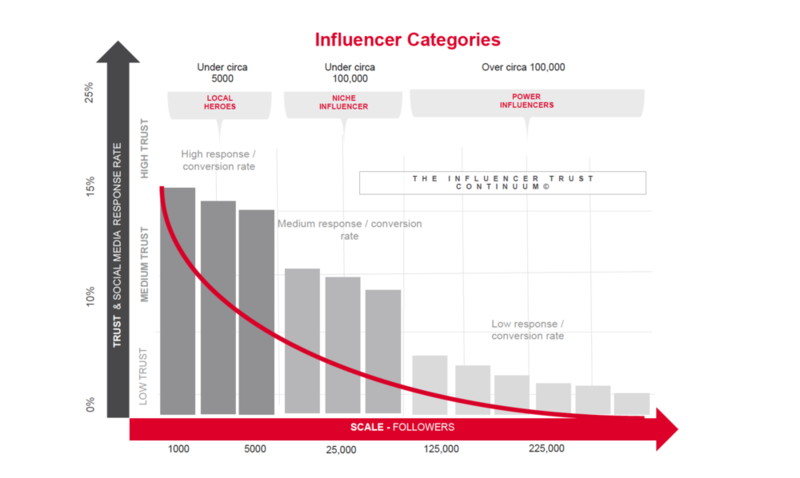 It’s a generalised graph, exaggerated but based on mountains of campaign data to illustrate the point that “Trust” and “Response” degrade as the scale of the Influencer increases. RESPONSE AND TRUST DEGRADE AS SCALE INCREASES. SO WHY ARE YOU SO OBSESSED WITH SIZE? INFLUENCERS ARE NOT AS RELEVANT AS THEIR AUDIENCE. SEARCH BY AUDIENCE, NOT INFLUENCER. (You need some machine learning tools for that). Sounds weird right? But what is it you are trying to do? Reach an audience. So when you start this process, search by audience psychographic first. Don’t obsess over @mrscandybuns (I made that up) start with your multiple customer and psychographic clusters and search for Influencers whose followers fit those. Then start looking at the Influencers this kind of search returns and choose those that best fit your brand values, or whatever metric is most important. Here’s a cut from a great machine learning tool that helps you search by audience. It’s the best way to start searching. Stay tuned for part 3/5, or get in touch for the full report. If these are all things pre-occupying you as a marketer, then you’re behind the curve. Incorrect. Most lifestyle Influencers have almost no authenticity & promote a completely manufactured life, by the above logic, it would mean brands should never use them – that makes no sense. Wrong. A-listers and Micro Influencers deliver completely different things for brands, they are not interchangeable. That was about three years off pace. There have been processes to figure this out for many, many years. 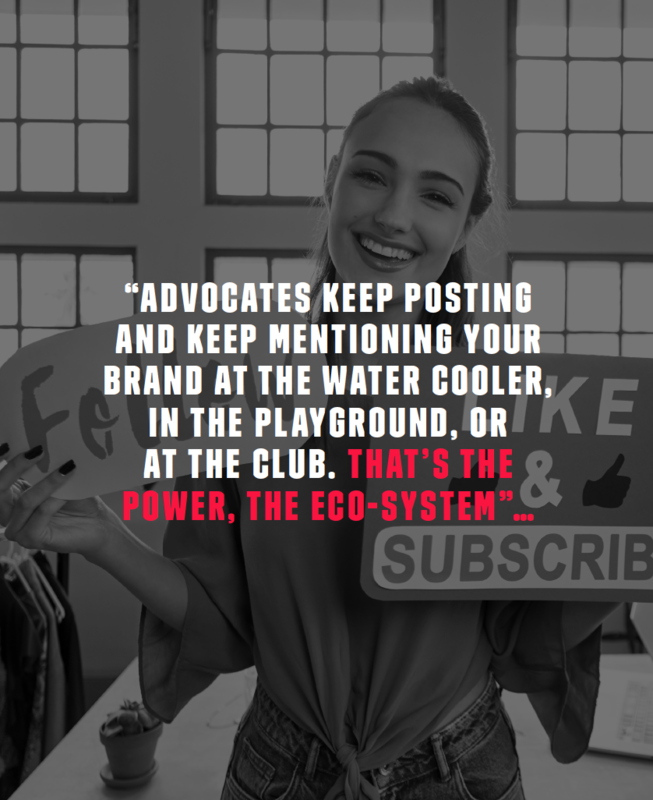 These blanket statements demonstrate the reality that large sections of the INFLUENCER MARKETING industry don’t fully understand how the channel really works. I don’t mean to sound disrespectful calling out the bad advice above, but this is an industry with a lot of inexperienced people given strong job titles - but dishing out weak advice. I think the reason is, a lot of people have only been in the biz for 3-4 years. That’s nowhere near enough time to understand this business; you simply haven’t experienced enough campaigns, in enough categories, or used enough data or tools to give a truly informed opinion. You might be able to run a perfectly good campaign in one category but that’s about it. And that’s the problem with the industry. The inexperienced give bad advice and blanket statements that might be correct perhaps for one campaign, in one niche, but they profess false truisms across the whole industry, causing untold confusion. 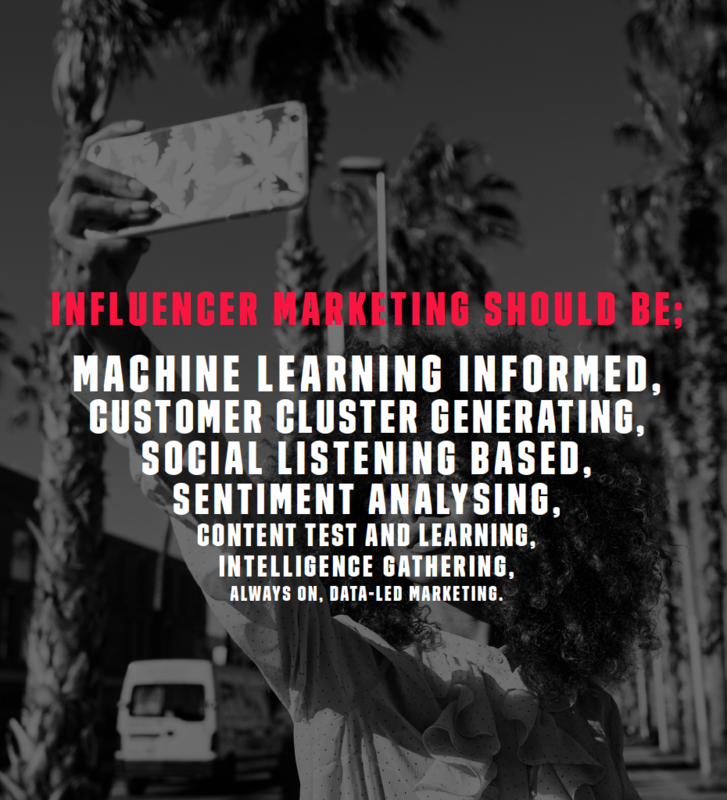 And this brings us to the crux, a lot of professionals in the industry have not figured out what Influencer Marketing really is, they are hived-off in one corner without an understanding of what else is going on. THERE IS NO RIGHT OR WRONG WAY, THERE IS ONLY A RIGHT OR WRONG APPROACH. There are some great brands taking the above point and making a killing, but they don’t tend to talk about it too much and the consumer press (and most of the trade) choose to talk about the badly executed campaigns and fraud. Done correctly however, Influencer Marketing will inform your business about what decisions to make across all your advertising channels. It is the singular best source of intel about your brand, customer and marketing effectiveness. It works better than any other tool or any focus groups. ﻿Under the Influence is written by Dudley Nevill-Spencer, Head of Strategy and Innovation at Live & Breathe. Stay tuned for part 2/5, or get in touch for the full report. Artificial intelligence (AI) and machine learning will ramp up it’s already increasing role in the marketing mix, as brands look to further personalise and automate communication across all channels. We’ve never had more accessible technology to gather big data about consumers. To cut through the noise, marketers must leverage the tools available to foster a deeper understanding of real human behaviour, not just faceless data alone. In turn, forging a more powerful and lasting connection between brand and consumer. The fact that smart speakers (and smart home products) are now largely mainstream (9.5m homes in the UK) creates a lucrative advertising opportunity for brands and marketers alike. Enabling them to serve bespoke automated content to their target audiences while they’re most receptive. Consumers and brands will become increasingly connected by shared learning and dialogue. Creating a conversation with your audiences by providing insights and knowledge is invaluable – working together to establish trust, and thus sales. Still a relatively underutilised market, local and micro influencers share much higher levels of trust with their followers than traditional influencers (the likes of Kendall Jenner) do. These guys (and girls) typically have below 5000 followers but staggeringly high engagement. Many brands are already on the bandwagon, getting much more bang for their buck. Political shifts mean that how and where products were made will drive spending. As retailers gather more consumer data, EQ will be key. Privacy concerns will have huge ramifications as consumers' shift away from sharing online. AI drives innovation across the entire value chain. Consumers are demanding greener store experience. Create new strategies to bring newness into stores. Video content is emerging as the next key shopping trend. Unattended in-home delivery gathers attention and retailers should build strategies around it. Consumers are increasingly wanting to participate in the extended life of the products they buy. There is an area in Miami called Wynwood. Wynwood has been, for many years, a part of town that you don’t walk through, ever. Not even in broad daylight. Even most South Florida residents wouldn’t walk through Wynwood. It’s a rough area with high drug and crime rates, and there’s always a story of someone who just got killed in Wynwood. However, there is one main street in Wynwood, and maybe three other side streets that are safe to walk down and are known for their beautiful graffiti murals. It also houses the Wynwood Walls, an outdoor museum that came later, showcasing large-scale works by some of the world’s best-known street artists. Just about every inch of the Wynwood Walls are an Instagram bloggers dream. Bright colours, incredible patterns, potent messages are fashion bloggers answer to dull brick backgrounds. Once a few fashion bloggers discovered the walls, word spread, hashtags were added and suddenly, Wynwood is described as ‘the most happening’ area in all of Miami. Artisan coffee shops have sprung up, whole food bakeries and every type of craft beer imaginable suddenly has a home in this particular, once avoided, part of Miami. Derelict warehouses have been turned into bakeries, art galleries and stylish bistros, not to mention late-night bars and craft breweries, while every new start-up is vying for real estate. Once upon a time you could easily drive down the main street, however, the queues of traffic and throngs of people have made driving through Wynwood a myth. Of course, there’s multiple factors at play, but so much of the success of this particular area is down to its fame on Instagram and as the need for beautiful backdrops rises, the masses flock to Wynwood. As consumers spend more and more time on the platform, hoping to find cool spots, great views and recommended products from their favourite influencers, social selling on Instagram becomes more and more important for brands. People will look for holiday destinations on travel blogger pages like Gypsea_lust and Doyoutravel before deciding their next holiday. Interior design ideas are garnered from bloggers like Alyssa Kapito and young millennials get life advise from the likes of Caroline Calloway. No matter what it is, we want to see it on Instagram before we buy it, the social platform becoming the new try before you buy. The coffee shops and areas of London that suddenly become Instagram famous because of a cool light instillation or a bloom of flowers around the door tell brands and businesses that if you want to attract crowds, make sure that your setting is Instagram worthy. Make sure the walls are painted, preferably in bright colours, the unattractive elements covered up and everything so picture worthy that it can’t help but attract hordes of people who are living that #gramlife. It’s easy to roll your eyes and logically think it’s ridiculous behaviour, and it absolutely is, but that doesn’t detract from the fact that it’s happening every day. Entire areas of cities are making money, and having money poured into them in business development and real estate projects, and all because enough people on Instagram liked it.